Our Mail Services facility provides customer services such as: Same Day Hand Deliveries, Assistance with all Mail Inquires, and provide the necessary materials needed for mail packaging and processing. Our mailrooms are equipped with “state of the art” Pitney Bowes Postage Meter machines. These machines are capable of processing all types of mail including: USPS Express Mail, Certified Mail, Regular Mail, Insured, International, and Priority. Non-medical supplies are distributed through the department for “offsite” clinics and buildings. 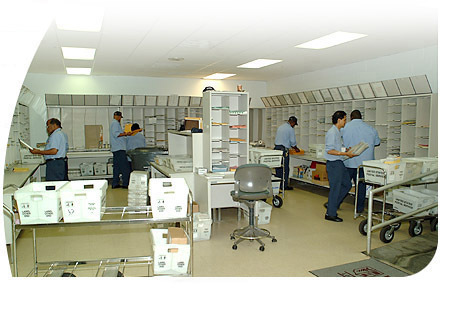 We provide full service mail and courier service to University Hospital. James Carr is the Coordinator for UH Mailing Services and UH Shipping & Receiving.